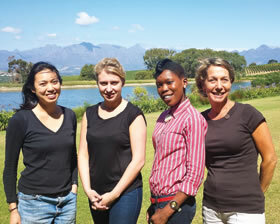 The passionate women in wine, Regine Lee, Laura Atkinson, Lungiswa Sithole and Kathy Jordan. In 2012, Kathy Jordan launched the Jordan Women in Wine initiative to help train and develop young women in the wine industry. Following the success that the project has since achieved on local and international level, Kathy has now handed over the reigns to Elizma Myburgh from Piwosa (Premium Independent Wineries of South Africa) in the hope that this initiative will touch the lives of even more women going forward. The Women in Wine initiative consists of an international and local component. On local level a promising, previously-disadvantaged woman who is already working in the industry, but is not a winemaker, is selected. “The Cape Winemakers Guild Protégé programme already provides opportunities for upcoming winemakers, and we want to reach the rest of the industry through this initiative,” explains Kathy. Lungiswa Sithole works at the Radisson Blu Hotel in Cape Town and is the first local candidate. The initiative is based on a combination of training and mentorship, and Lungiswa has already passed her Wine and Spirit Education Trust (WSET) Level 1 and 2, while also visiting Jordan on a regular basis to practically learn about the workings of a wine farm and cellar throughout the year. For Lungiswa it is both a big opportunity and challenge, but she is well aware of the fact that she cannot afford to let this opportunity pass her by. The initiative has changed her life and while it is not always easy, she continues to pursue her passion in the hope that she will one day become a qualified sommelier. In conjunction with this initiative, Jordan has also sponsored two other candidates to complete the WSET Level 1 course. Nikko Mayo from Jordan Restaurant and Kholeka Melane from Den Ander Restaurant both recently passed this course. “There are many women working outside of the winemaking division of the industry – from waitresses and saleswomen, to marketers and journalists – and we want to focus on this group and invest in their careers, as ultimately it will benefit the entire wine industry,” says Kathy. The international component of the Women in Wine initiative is based on the same principles and creates opportunities for trained, international women to participate in an internship at Jordan in South Africa. Due to the natural ties between Jordan and the UK, the programme initially began there, but has since been made available to any international women with a recognised degree or diploma in Oenology, or a minimum WSET Diploma. The initiative is endorsed by Jancis Robinson and advertised on her website, and according to Kathy they have received unbelievable interest from all over the world. Jancis will be one of the speakers at the VinPro Information day in January next year. Two international candidates were chosen last year to take part in the 2014 harvest season at Jordan. Regine Lee, an American living in the UK, is an international business manager for WSET, and Laura Atkinson, a Brit, works for Berry Bros. & Rudd. Regine and Laura spent about seven weeks harvesting at Jordan earlier this year, and also visited other South African wineries and regions during this time. Laura found it incredibly valuable to physically experience the winemaking process, rather than merely reading or talking about it. “It was not what I expected, it was much more difficult, but also more rewarding!” she says. According to Regine the practical experience also encouraged her as a woman in the industry. “I met so many inspirational women during my time here and I am proud that we are equal to men in the industry. It’s not all about physical size and strength – women are just as capable,” she says. Apart from the physical harvest experience, the internship also aims to market South Africa as a wine producing country, and both Regine and Laura are full of praise in this regard. Regine believes that although South African wine can compete against a multitude of other wines on the international market, the real marketing edge is the story behind our wines – the personalities and philosophies, unique terroir and history. This helps people to understand the wines better and encourages them to drink more of it. It has now been two years since Kathy launched the initiative, and it was recently decided to expand the project further by making it accessible to the members of Piwosa, of which Jordan is also part. Elizma Myburgh will henceforward manage the administration and she explains that while all 15 members will not be able to offer internships, the programme will try to give international candidates exposure to as many wineries and wines as possible. On local level, participating Piwosa members will choose their own candidate and in this way even more South African women will receive the opportunity to realise their dreams and ideals in the wine industry. Starting with Kathy’s humble idea to make a difference and to simply do “something” for women in the wine industry, this initiative has now hit its stride and is able to reach and empower more women to pursue their dreams with passion and hope.